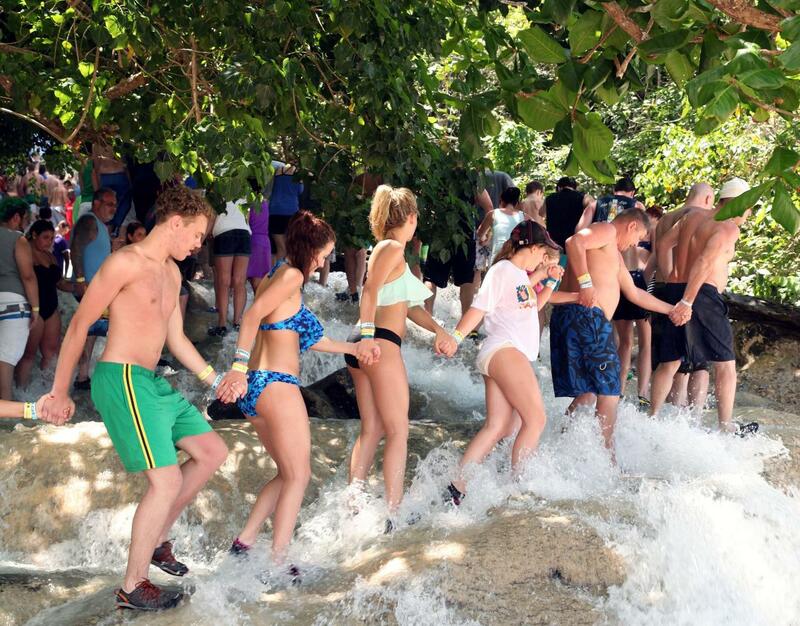 This Dunn's River Falls and Blu Beach experience is a must-do event for all visitors to Ocho Rios. Visit the magnificent Dunn's River Falls, the most-climbed falls in the world. Climb the famous 600-foot waterfall that has been featured in many movies. Then enjoy the Caribbean waters swimming and sunbathing at the Bamboo Blu Beach! Please wear your swimsuit under your clothes and get ready for fun! After a pickup from your Ocho Rios hotel or the Ocho Rios cruise ship port, enjoy a scenic ride to Dunn's River Falls, a famous Jamaican waterfall and popular tourist attraction. The falls are 180 feet high and 600 feet long with natural, terraced steps for climbing. Explore the most climbed falls in the world. Enter the park with a prepaid ticket and greet a licensed 'Fall Guide' who will provide an introduction and safety orientation before the climb. Experience one of Jamaica's oldest hydro electric plant. See how wood is used as pipes to carry water "The Black Pipe". Now you are in the rainforest "River Gully" where your adventure becomes epic with the water falls climbing, blue hole jumping and underwater cave exploration at the "Island Gully Falls & Blue Hole". Next travel further into the rainforest to Hidden Beauty Rainforest Oasis to complete the tour. Admission to the exclusive Bamboo Blu Beach Club. Wear your swimsuit under your clothes and get ready for fun! Falls climbing is optional and those who do not participate can have just as much fun watching. Bring Towel and Cash for food and souvenir.